Delaware City Engineer Bill Ferrigno, right, provides an update to Delaware City Council about The Point improvement project at its meeting on Jun. 26. The city of Delaware has secured more than $19.5 million to make improvements to The Point. The combination of federal, state and local dollars will fund a construction project aimed at easing the traffic bottleneck at the intersection of State Route 37 and U.S. 36 on the city’s east side. Construction would begin sometime in 2022, according to Delaware officials. 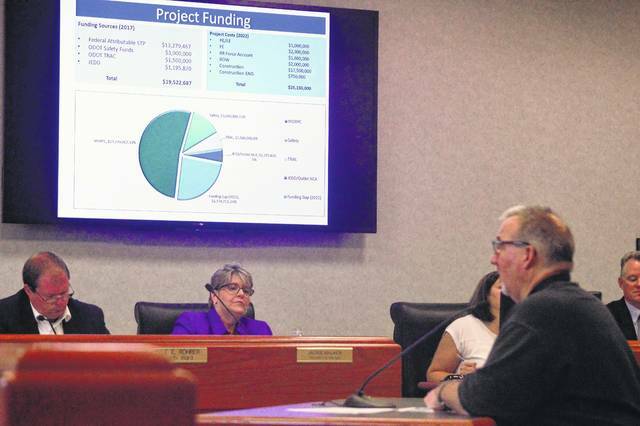 The city is in a good position with 76 percent of the funding secured for the estimated $25.15 million project, said City Engineer Bill Ferrigno. “We are ahead of the curve, so to speak, on this type of project,” he said. Ferrigno said he already has a preferred consultant in mind for the project. The Mid-Ohio Regional Planning Commission awarded Delaware $13,279,467 in federal funds, while the Ohio Department of Transportation awarded $4.5 million in grants to help with the design and right-of-way acquisition phases of the project. The city will utilize about $1,195,820 in shared income tax revenue with Berkshire Township from the Joint Economic Development District at the Tanger Outlets Columbus mall. Delaware plans to formally request funds from Delaware County, which helped rank The Point project as the third most important project for the central Ohio region in April. The city plans to ask the state for additional funding in 2019. ODOT would handle the actual construction, Ferrigno said. Delaware could have utilized funds from the failed 2016 road income tax levy for the project. But Mayor Carolyn Kay Riggle said The Point’s improvement was never contingent on the levy’s success. “The levy was never there to do this project,” she said. Councilwoman Lisa Keller, 2nd Ward, said drivers should use both lanes when traveling westbound towards The Point. “It’s going to be a number of years before this fix is in place,” she said. Keller added that she sometimes gets “gestures” when she uses the left lane to merge just before the infamous intersection. “I get the same response sometimes,” Ferrigno said. He said there are efforts to update signage in the area to encourage drivers to use both lanes. “It is more efficient to use both lanes and merge politely,” he noted.